Police say Justin Bieber has accidentally struck a photographer with his pickup truck in Beverly Hills. The Los Angeles Times reports that police Sgt. Matthew Stout said the 57-year-old photographer was hospitalized Wednesday night with injuries that were not life-threatening. The newspaper said Bieber "fully cooperated" with officers at the scene. Video posted on social media shows Bieber getting into his truck with a crowd of photographers around him. As he pulls away, one of them steps toward the truck and is hit. Another clip shows Bieber kneeling beside the injured man asking him what he needs. 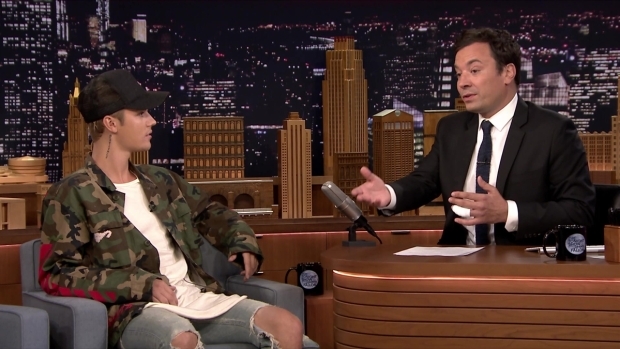 Justin Bieber talks to Jimmy Fallon on "The Tonight Show" about the emotions that led to his tearful 2015 MTV Video Music Awards performance. Bieber had announced earlier this week he was canceling the last several weeks of his Purpose world tour "due to unforeseen circumstances."